Time for a new set of warm clothes! Each item has been chosen in a generous size in order to last more than one season… Down jackets, lined trousers and boots were more than welcome this particularly rough winter, and it’s not over yet either. 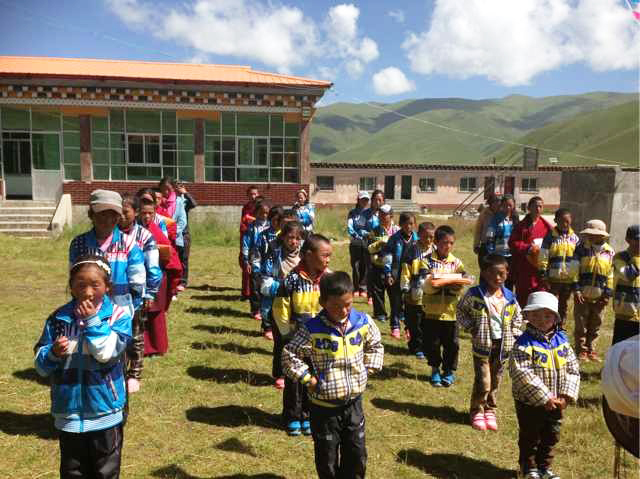 Good news for the Dzogchen school children: we have been able to purchase a total of four cows to add to the school’s small herd, which is now once again capable of furnishing the school with essential dairy products. The four dri have been entrusted to a nomad family, which takes good care of them and processes the milk, allowing the children to enjoy fresh butter and cheese every day. Today, Tibetan medicine is practised in Tibet itself, in other Himalayan countries like Nepal, Ladakh and Bhutan, in China, Siberia and Mongolia, and in India, where the small town of Dharamsala, residence of His Holiness the Dalai Lama, hosts the Tibetan Medical and Astrological Institute (the Men Tsee Khang). Its mission is to safeguard, develop and promote this precious ancestral knowledge, locally as well as in some fifty hospitals throughout India and Nepal. The doctors, called amchis, traditionally start their learning at a very young age, and the knowledge is often passed on from father to son. Their training includes the study of Buddhist texts, medical works and astrology as well as healing techniques and the identification of medicinal plants. The amchis search the mountains for these plants and transform them into medicine using techniques that have remained unchanged for millennia. Heirs to this knowledge, today’s amchis face new challenges. Firstly, with a view to international recognition, Tibetan medicine will need to conform to international classification systems and quality standards without losing its unique character. Secondly, to practise their science, the amchis depend entirely on the Himalayan ecosystems, which are in many places fragile. Overharvesting botanical resources might prove disastrous and quickly lead to an impoverishment in ecological diversity. Deepening the knowledge of their global environment is therefore crucial and may lead, as a partial solution, to the systematic cultivation of medicinal plants. To youngsters wishing to become amchi, a new avenue has recently opened: medical faculties are proposing an approach to the Tibetan medical system similar to what we know in the West, respecting nevertheless all the particularities of the amchis’ science. Students are trained for a period of at least seven years. In the West, Tibetan medicine is presently not officially recognised in the majority of countries. As a result, Tibetan doctors are not authorised to practise. Nevertheless, Tibetan medicine sparks plenty of curiosity and interest, as crowded conferences and seminars testify. Could they not learn from each other, highly specialised and technological western medicine and Tibetan medicine with its global approach of the individual as a whole? Could they not prove complementary in the end? Feel like trying a typical Tibetan dish? Here is the recipe for Tentuk. Ten means to pull/draw and tuk is short for tukpa, which means soup. Tentuk is a noodle soup hugely popular in the whole of Tibet. ½ oignon, 250 gr of beef, 3 tablespoons of oil, 1 teaspoon of vinegar, 1 tablespoon of soy sauce, barley flour, various vegetables (e.g. Chinese cabbage or carrots), pepper, salt, finely chopped hot pepper. 1. Prepare the dough: add water to the flour to make a quite tough mixture, then knead and let rest for 30 minutes. 2. In a pot, lightly fry the meat in some oil. 3. Add the meat and vegetables to boiling water and let boil for about 10 minutes. 4. Flatten the dough by hand. A few minutes before the meat and vegetables are done, cut the dough into pieces and add to the boiling water. 5. Let boil for 2 to 3 minutes. 6. Your tentuk is ready! En ce mois de février, les Tibétains s’apprêtent à quitter l’année 2141 qui fût l’année du Cheval de Bois pour entrer dans celle du Mouton de Bois. C’est avec une très grande joie que l’asbl Zangdok Palri Lotus vous convie à la célébration de cet événement festif, en présence de Ranyak Patrul Rinpoche et de Khenpo Thubten Lodru Nyima. 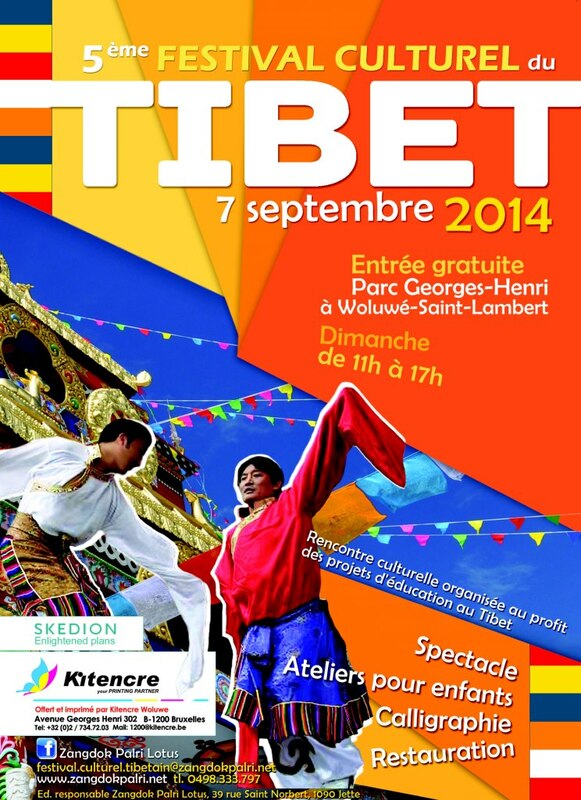 Ce sera une occasion unique de découvrir, en famille, la culture et les traditions du Tibet. Vous pourrez assister à une représentation théâtrale d’un épisode de la vie du légendaire héros Guésar de Ling. Nous aurons aussi le plaisir d’accueillir la chanteuse japonaise Yuka Kawabe qui partagera avec nous sa passion pour la musique et les instruments traditionnels tibétains. 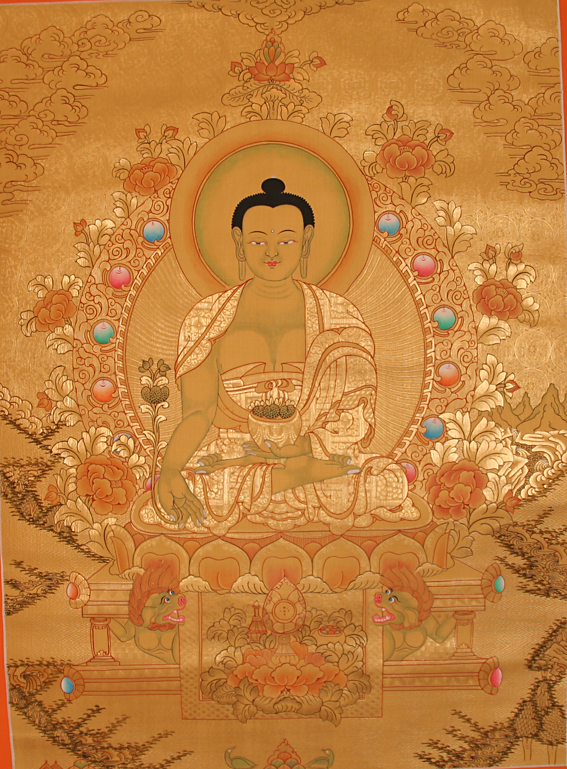 Une exposition vous présentera la vie au Tibet, l’histoire de Bouddha et la peinture traditionnelle sur toile (les thangkas). Ce sera l’occasion également de déguster de délicieuses spécialités culinaires tibétaines, de découvrir des danses et des chants tibétains de la région de Dege. Les visiteurs trouveront aussi un stand de calligraphie, une boutique d’artisanat équitable et les plus jeunes seront ravis de participer aux animations pour enfants tout au long de l’après-midi (peinture, dessin, mandala de sable, grimage…) et bien d’autres petites révélations qui vous rendront cette culture plus proche et plus accessible. Le bénéfice de cet événement est destiné aux projets éducatifs et culturels menés au Tibet par l’association Zangdok Palri Lotus. Nous serons ravis de vous accueillir à la Cité du Dharma ! Le bar est ouvert pour les boissons supplémentaires et le dessert. Le nombre de places étant limité, il est conseillé de réserver. 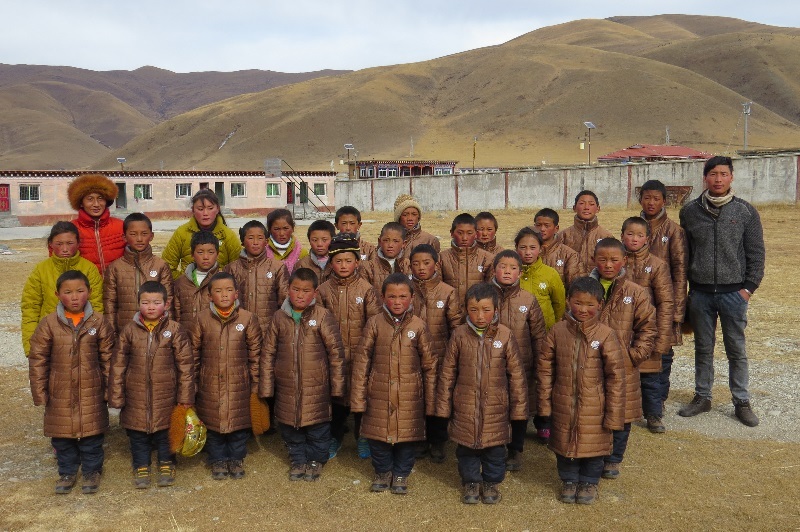 To all our sponsors and donors, a big thank you from the children of Dzogchen! is over for the first generation of students. Today’s seniors have passed their final exams in primary school and after some ten years of studies are now headed for higher education. As a result, 15 new students have found a spot in our primary school. For them, the first order of business in student life has been the purchase of a winter wardrobe, padded jackets and sturdy shoes to face the harsh Dzogchen winters (see cover picture). Two additional outfits will serve for summer and spring/autumn. We are all set for the new school year! Traditional Tibetan medicine is one of the oldest medical systems still practised today. Its approach is holistic, taking into account the whole individual, including all physical, mental and spiritual aspects, the person’s internal as well as external environment. Informed by Indian ayurvedic medicine and the Chinese, Persian and Greco-Arabic medical traditions, Tibetan medicine is a perfectly coherent synthesis of all these insights, deeply infused with buddhist spirituality. Observing how the whole universe consists of the five elements (water, earth, fire, air and space), Tibetan medicine concludes that the basic forces of nature are in constant interaction with our organism, influencing it and making themselves available for its healing. The three ‘humours’ (bile, wind and phlegm) are the energetic expressions of an individual’s state of health and need to be balanced for the person to enjoy good health. Various mental and physical factors can disrupt this balance: the prime causes of ill health are the ‘mental poisons’, i.e. negative emotions, closely linked to the humours. There is an additional range of secondary causes, however, such as nourishment, lifestyle or unfavourable surroundings, lack of exercise etc. The diagnosis is based on pulse reading, in which the physician palpates both the patient’s arms simultaneously with three fingers of each hand, gaining information on all the vital organs. To this are added urine analysis, examination of the eyes and the body as a whole, as well as a consideration of the patient’s lifestyle in its various aspects. The physician, named amchi, may also turn to astrology, identifying the patient’s astrological make-up and determining favourable days for treatment. To restore the balance of the humours, amchis will prescribe lifestyle changes, physical exercise and dietary adjustments. Other therapies include acupuncture, moxibustion, cupping, massage and of course Tibetan drug-making, always natural, based on plants and minerals, sometimes even precious stones, gold or silver. In Tibetan medicine, however, healing of the body is achieved primarily through healing of the mind. As illness is caused by emotions triggered by unsuitable thought patterns and behaviour, it is essential that the patient adjusts his take on life and increases his understanding of his own internal world and the emotional factors that give rise to his illness. goes to the children from the primary school in Weiler-la-Tour and their teacher, Mr Christian Schartz. They offered the funds raised through their annual book market, which was, like the years before, a great success! We were able to purchase a new yak cow, in addition to the two cows already belonging to the Dzogchen school. Yak cows, called ‘dri’ in Tibetan, produce less milk than cows but their milk has a high nutritional value. Being rich in carotene, it is of yellowish colour with a delicious taste, and its high content of butterfat makes it perfect for yogurt, butter, and cheese. A very welcome enrichment of the school’s menu, helping us to take care of the students’ health in a tasty and natural way! 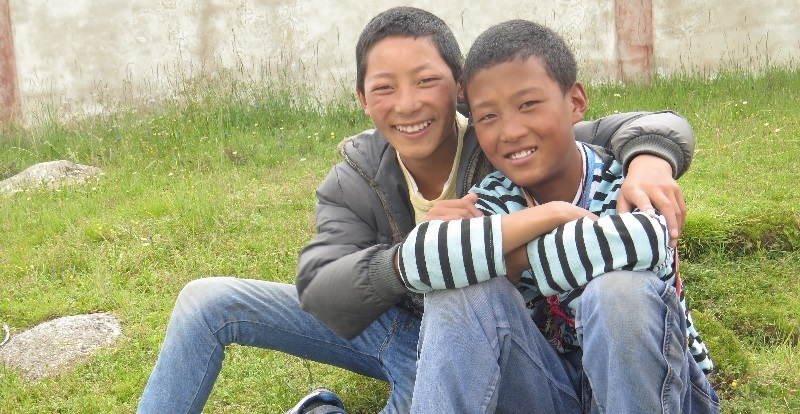 A tous nos parrains et donateurs, un grand merci de la part des enfants de Dzogchen! se termine pour les plus grands élèves, ceux et celles de la première génération qui y étudient depuis une dizaine d’années, qui ont passé avec succès leurs examens de fin d’étude primaire et se dirigent maintenant vers une structure secondaire. Les bancs de l’école primaire ont donc pu accueillir 15 nouveaux élèves, pour qui la vie scolaire a débuté par l’achat de vêtements d’hiver, doudounes épaisses et chaussures solides pour être parés contre les hivers rudes de Dzogchen (photo en couverture). Deux autres tenues complèteront leur garde-robe, pour l’été et pour le printemps/automne. Nous voilà fin prêts à nous lancer dans la nouvelle année scolaire! La médecine traditionnelle tibétaine, un des plus anciens systèmes médicaux à exister encore aujourd’hui, se base sur une approche holistique : elle prend en compte l’individu dans son ensemble, incluant tous les aspects physiques, mentaux et spirituels, l’environnement intérieur de la personne aussi bien que son environnement extérieur. Inspirée de la médecine ayurvédique indienne et des médecines traditionnelles chinoise, perse et gréco-arabe, la médecine tibétaine est la synthèse parfaitement cohérente de tous ces savoirs, imprégnée profondément par la spiritualité bouddhiste. Se basant sur la constatation que tout notre univers se compose de cinq éléments (l’eau, la terre, le feu, l’air et l’espace), la médecine tibétaine en déduit que les forces basiques de la nature sont dans une interaction incessante avec notre organisme, l’influencent et peuvent être utilisées pour le guérir. Les trois ‘humeurs’ (bile, vent et phlegme) sont l’expression sous forme d’énergie de l’état de santé d’un individu et doivent être maintenus en équilibre pour que la personne soit en bonne santé. De nombreux facteurs mentaux ou physiques peuvent bouleverser cet équilibre : les causes premières d’une santé altérée sont les ‘poisons mentaux’, c’est-à-dire les émotions négatives, étroitement liés aux humeurs, mais il existe aussi toute une gamme de causes secondaires, comme une alimentation, un mode de vie ou un environnement inappropriés, le manque d’exercice etc. Le diagnostic se base sur la prise du pouls, palpé simultanément sur les deux bras du patient par trois doigts de chaque main du médecin et qui donne des informations sur tous les organes vitaux du corps. A cela s’ajoutent l‘analyse des urines, l’examen des yeux et du corps dans son ensemble, ainsi que les différents aspects du mode de vie du patient. Il est possible que le médecin, appelé amchi, ait aussi recours à l’astrologie, établissant le thème astral de la personne souffrante et déterminant les jours favorables pour son traitement. Pour rééquilibrer les humeurs, les amchis vont prescrire des changements dans le mode de vie, de l’exercice physique et des modifications du régime alimentaire. D’autres moyens thérapeutiques peuvent s’ajouter : l’acupuncture, la moxibustion, la pose de ventouses, le massage, et bien sûr la pharmacopée tibétaine, toujours naturelle, à base de plantes et de minéraux, parfois même de pierres précieuses, d’or ou d’argent. Mais pour la médecine tibétaine, la guérison du corps passe surtout par la guérison psychique. Puisque les émotions qui causent la maladie sont engendrées par des modes de pensée et de comportement inadaptés, il est important que le patient ajuste son attitude face à la vie et développe d’avantage de compréhension par rapport à son propre monde intérieur et aux facteurs émotionnels dans lesquels sa maladie est enracinée. aux enfants de l’école primaire de Weiler-la-Tour et à leur instituteur, M. Christian Schartz, qui nous ont offert la recette de leur Marché aux Livres qui a connu, cette année encore, un franc succès! Nous avons pu acheter une vache de yak qui rejoindra les deux vaches appartenant déjà à l’école de Dzogchen. Les vaches de yak, appelées ‘dri’ en tibétain, produisent moins de lait que les vaches mais leur lait a une valeur nutritive élevée. Riche en carotène, il est de couleur jaunâtre avec un goût excellent, et par sa haute teneur en matière grasse, il est parfait pour le yaourt, le beurre et le fromage. Un enrichissement bienvenu du menu de l’école, qui contribuera à la santé des élèves d’une manière savoureuse et naturelle! 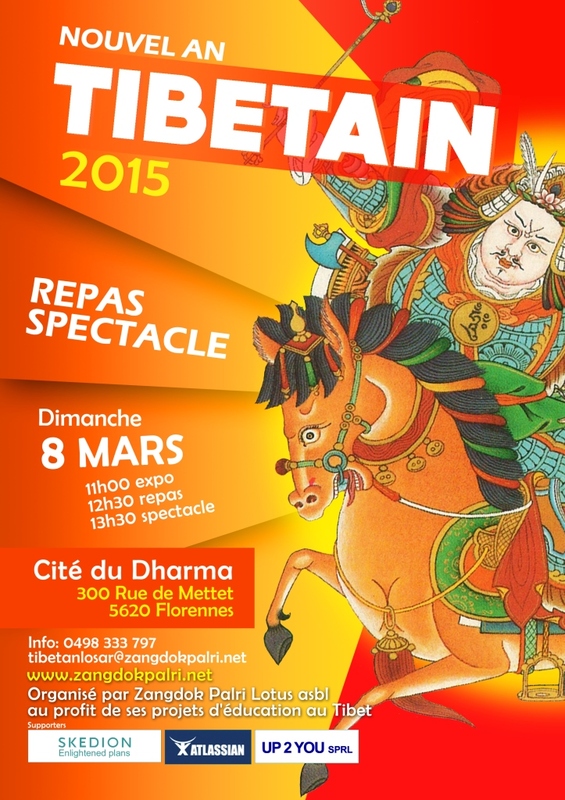 Pour sa 5e édition, le désormais traditionnel Festival Culturel du Tibet accueillera à nouveau petits et grands dans le cadre magnifique du Parc Georges-Henri pour une journée exceptionnelle de rencontres et de découvertes. Dégustez des spécialités culinaires préparées par nos cuisiniers tibétains… Des jeux et des ateliers créatifs seront proposés aux enfants. Toutes les activités se dérouleront en plein air, dans une grande tente en poils de yak et dans des tentes de fête telles qu’elles sont utilisées encore aujourd’hui par les nomades tibétains lors des grandes occasions festives. Spécialités culinaires tibétaines servies à partir de 12h00. 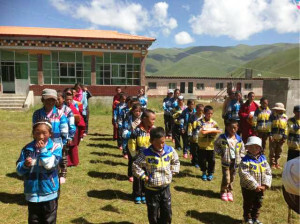 Les bénéfices du Festival sont destinés aux projets éducatifs menés au Tibet par l’association Zangdok Palri Lotus: l’Institut Zangdok Palri et l’école primaire-orphelinat Sambhota à Dzogchen, ainsi que l’école secondaire Sambhota à Chengdu. It has been a promising and very active start of the new year for our students! On top of their regular courses, they have been able to participate in an editing project of ancient texts, an activity we hope they will have many more opportunities to engage in. This project was launched by Patrul Rinpoche, founder of the Sambhota schools, and is managed by the Sambhota Translation Group. It involves revising, translating and publishing traditional Buddhist texts collected over the centuries, with a view to their preservation. The Tibetan source texts are very much in need of revision. As they were engraved onto wooden planks or prepared for printed publication, many errors crept in. Keep in mind that almost all of these texts have yet to be translated from Tibetan for the first time. This particular project encompasses texts compiled in the 19th century and running up to some 5,000 pages in 9 volumes. We have only the Tibetan version today, part of which the students have reread and corrected in terms of spelling and grammar. Le Nouvel An tibétain est un événement culturel destiné à faire découvrir le mode de vie et les habitudes culturelles du Tibet; le bénéfice de cet événement est destiné à nos projets d’aide au développement au Tibet. Tout au long de l’après-midi, jeunes et grands pourront découvrir, comprendre et se familiariser avec divers aspects de la culture tibétaine au travers de nombreuses activités animés par nos membres et nos invités: dégustation de spécialités tibétaines, théâtre, expositions, chants et danses tibétaines et indiennes, guitare tibétaine, calligraphie, boutique d’artisanat d’art équitable. Morning role call in Dzogchen. Quite a few changes at the end of the school year! 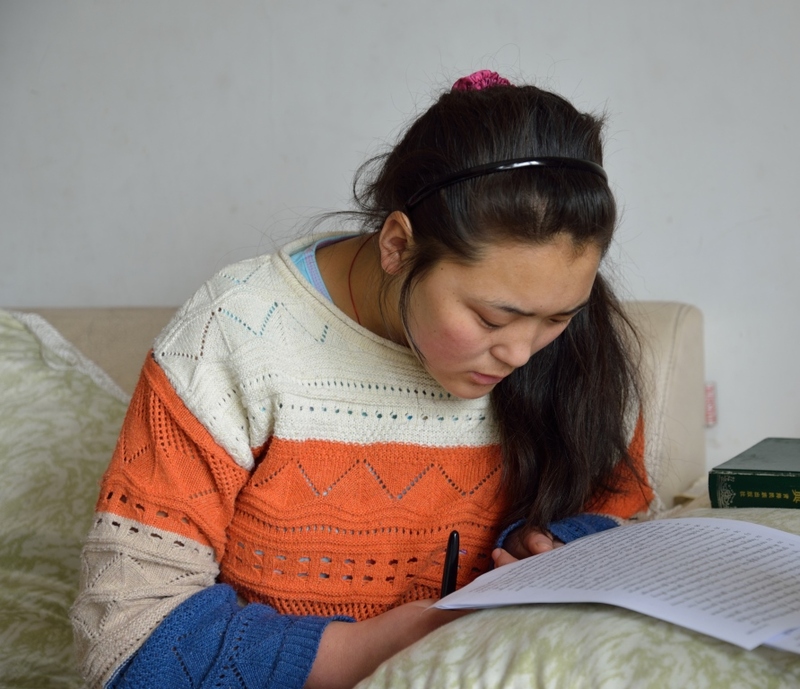 Having passed their primary school final exams, five of the eldest students have expressed a wish to continue their studies, and to do so as monks at Dzogchen monastery. This wish is perfectly traditional among Tibetans, with parents proudly approving their children’s choice for the Buddhist path and the monastic life. 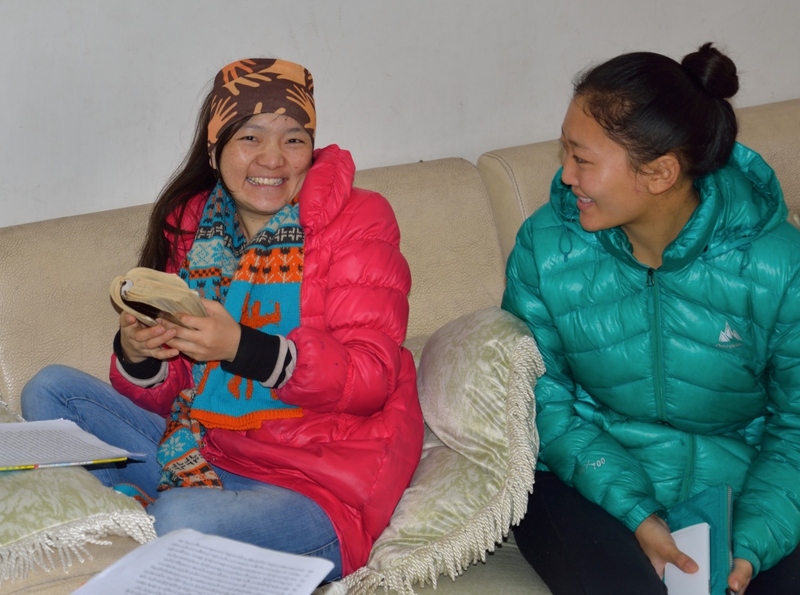 Six other students, having completed their school career at Dzogchen, have returned to their families to offer much-needed help in the everyday cares and tasks of the nomadic life. 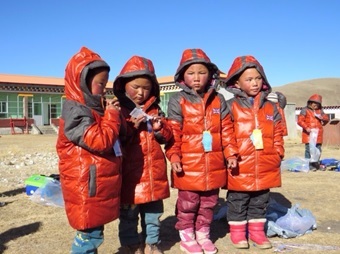 Their places at school have already been taken by new young students, including some ten children from Dzogchen village who follow tuition without taking board. School life continues in all serenity for the 35 children currently enrolled. The main event at the start of this year will be the testing and selection of a new teacher by our local responsibles. This new teacher will assist the current headmistress. all 4 of our secondary students have started their second year, perfecting their language skills in Chinese and Tibetan under the outstanding guidance of their teachers. Meanwhile, back in Dzogchen, our youngest students are working doubly hard to be able to cross the threshold to the oh so coveted secondary school!